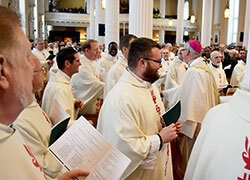 Eight priests from across central and southern Indiana represented the Archdiocese of Indianapolis at the Jan. 29 Mass at St Joseph Co-Cathedral in Burlington, Vt., in which Bishop Christopher J. Coyne was installed as the 10th bishop of Burlington. As the opening procession of the liturgy came to a close, Bishop Coyne, who served for four years as an auxiliary bishop for the Church in central and southern Indiana, came and shook the hands of the archdiocesan priests. “He stood by us until he was called forward to take his new seat, and, in that moment I was struck with feelings of joy for him, but also sadness for us. It was a beautiful gesture,” said Father Hollowell, pastor of Annunciation Parish in Brazil and St. Paul the Apostle Parish in Greencastle. Father Eric Augenstein, archdiocesan vocations director, also attended the liturgy and was impressed by how it displayed many connections tying the Church in central and southern Indiana to the faithful in other parts of the country and beyond. “Priests, religious and lay faithful from Indianapolis, Boston, Burlington and many other places joined together for the celebration of Bishop Coyne’s installation as a visible sign of the universality of the Church,” Father Augenstein said. Father Jonathan Meyer, pastor of All Saints Parish in Dearborn County, listened carefully to Bishop Coyne’s homily in which the new shepherd of the Church in Vermont called the faithful to join him in reaching out into the broader society with the Good News of Jesus. Father Hollowell appreciated that, in his homily, Bishop Coyne was clear in mentioning that many people are leaving the Church and that the prevailing culture is growing ever more secular. Father Meyer was ultimately glad to have made the trip from his home in southeastern Indiana to Burlington to witness and be a part of what the Church has done for centuries in locales around the world.